Our physical therapists, in addition to their professional expertise, draw on their experience as competitive athletes: we are marathoners, triathletes, swimmers, yoga and Pilates practitioners, and dancers. 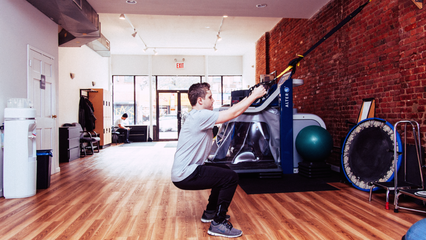 We are offering the best of both worlds to keep the Brooklyn community healthy and fit. Areas of Expertise Sports Rehabilitation Spinal Conditions Neurological Rehabilitaion Patrick Nichols completed his studies at Ithaca College with a Doctorate of Physical Therapy. Since graduating, he has worked in a variety of physical therapy settings including sports rehab, general orthopedic, post-op, neurologic, and geriatric patients. Patrick utilizes a wide array of interventional skills, with strong focus on manual techniques. He enjoys treating a wide variety of diagnoses with an express interest in shoulder, knee, spine, and post surgical cases. He is particularly interested in the spinal disorders and took a number of advanced training courses in Maitland-Australian approach to treatment. Patrick is currently working toward a prestigious Orthopedic Certification Specialist (OCS) certification. Outside of physical therapy Patrick enjoys music, going to concerts, exercise, and travel. Areas of Expertise Pre and Post Operative Sports Injuries Genya attended the University of California, Santa Barbara where she received her bachelor's degree in Psychology. She later received her Doctorate of Physical Therapy at Hampton University. Her final research project was on ""The Effects of Body Weight Support Treadmill Training on Gait Speed in Subacute CVA Patients""; she hopes to discover if similar results can be obtained with the in-house Alter-G Treadmill. Genya holds interest in orthopedic physical therapy, especially improvement of shoulder strength and range of motion, and wishes to focus future learning on ortho and amputee/prosthetics function and training. Genya found her way to physical therapy through sports; she played high school football and paddled on the dragon boat team, and currently can be found either rock climbing or playing flag football in the park.